U.S.-based tuner E.C.D. 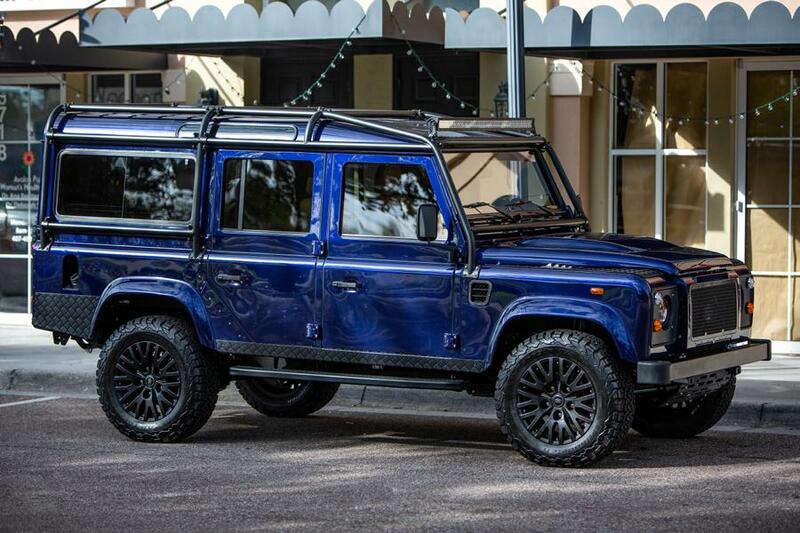 Automotive Design, a company dedicated exclusively to the restoration and customization of Land Rover Defender vehicles, has finished working on yet another project, called the Project Azure. The British SUV left the garage equipped with new, reinforced bumpers, a full-fledged exterior roll cage, auxiliary lighting in front and on top, fender flares, a Borla performance exhaust system, and 18-inch Kahn Defend 1983 rims wrapped in meaty BF Goodrich T/A K02 tires. As per the standing tradition, the custom Land Rover Defender D110 also gained the iconic Heritage Edition Anniversary grille. The tuner lifted the suspension by two inches (5 cm) and replaced the stock engine with a 6.2-liter Corvette LS3 V8 linked to a 6-speed manual gearbox for up to 600 hp / 450 kW nominal output. The interior of the Project Azure greets with a light leather trim interspersed with black accents. There are Corbeau Trailcat RRS sport seats, a Momo Millenium Evo steering wheel, an advanced Sony multimedia system and much, much more. E.C.D. Automotive Design did not mention the price of the one-off vehicle.